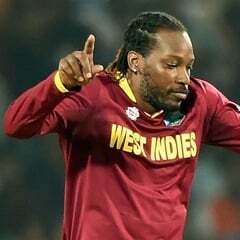 Sydney - West Indies cricket superstar Chris Gayle is seeking to cash in on a court case win against an Australian media group, promising a tell-all interview - but only if the price is right. A hearing on damages will be held at a later date, but Gayle is already offering his story for a starting price of $300 000. "I have a very interested (sic) successful story to tell!! It can be an exclusive 60mins interview or y'all just have to wait on my next book!," he tweeted to his 3.75 million Twitter followers on Friday. "How they want to use me as a scapegoat over an interview - I'll tell you what I do every day after court, believe me, when I break this down to y'all it will be like a movie! No holding back! "Biding (sic) starts at $300K for this interview! So much to say & I will!" Fairfax published the allegations in the wake of an uproar after Gayle attempted to flirt with an Australian presenter on live TV, asking her out for a drink and telling her: "Don't blush, baby." Speaking after the trial, Gayle said the case had been "very emotional". Fairfax has yet to announce whether it will appeal the ruling.